Buy Hybrid Walnut MJ209 online from UK tree supplier of cell grown broadleaf hedges and shrubs. As the name suggests, this particular Walnut has been selectively bred from two differing popular Walnut species to improve some of its properties. In the case of Walnut MJ209, these were increased vigour and less prone to disease. The MJ209 also tolerates sites with less than perfect drainage. Trials by the Institut pour le Développement Forestier (IDF) in France, showed excellent growth of 6-9 metres at the 8 year point of a range of Hybrid Walnuts, MJ209 being one of them. Expect the first four-five years of growth to be slow as the tree is putting its resources into the roots. After that, you should see a higher rate of annual growth. Expect a final height of 25m or more, depending on local conditions. Planting nitrogen fixing plants or trees nearby e.g. Alder, could give your Hybrid Walnut a boost. Our hybrid Walnut is well suited to Northern European weather conditions which means everyone who yelled their approval at the screen when watching Braveheart can grow one. The hybridisation has made it tolerant of more site conditions than many other Walnuts and is expected to deal with climate change easier so your success rates should be higher. Plant our Hybrid Walnut MJ209 in deep, fertile soils (100cm or more) that are well draining and preferably in the PH range on 5.5 to 7.5. These can also be referred to as deep sandy or clay Loams. Although the MJ209 has better resistance to frost, no frost at all is better so try and not plant in valley bottoms. If you have particularly poor soil then a hybrid will give you much better results. Dig the hole wide and deeper than the roots by 20% or more. Break up any compacted soil aka clumpy/lumpy and mix with 50% compost or well rotted manure if you suspect poor quality. Clay has the advantage of retaining water but poor drainage and 100% compost has the advantage of fertility but too easily drained. Mixing the two together gives you best of both Worlds. For the purists, aim for a mix of aggregate sizes from 0.5 mm to 20 mm. Remove surrounding grass and weeds by 50cm or more. Using weed control fabric or a mulch to suppress further grass and weed growth is a good idea until the tree is well established which is usually at least a few years. Water well and keep watered especially in the Summer. If you have a particularly thick layer of clay or rock and thin top soil, consider mounding. This is where you create the depth of topsoil by creating a mound (the clue was in the title). This also has the advantage of good drainage. Plant at least 7m apart for fruit production and 5m for wood. Look more into growing Walnut for wood as it is a bit more complicated and it is suggested you inter-plant with other tree species to promote straight growth. If you want to feed your Hybrid Walnut, do so in Spring with a Nitrogen rich fertiliser. Do not feed in late Summer as this promotes new growth which would be exposed to frosts. For the conspiracy theorists and fact allergic screaming "genetic manipulation gone mad", then be mad at Mother Nature because she does this all the time. 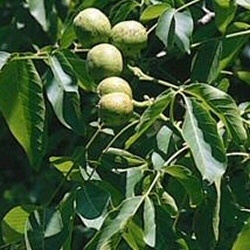 Walnut trees in the wild cross pollinate with other Walnuts and produce many variations. The difference being that Mother Nature will sometimes grow trees worthy of being on Jeremy Kyle or some other car crash TV and we don't. As with all Walnut trees, the timber is a hardwood and very popular with furniture makers. Hybrid Walnut does not have the dark heartwood but is easier to work with, can be sliced for veneer and is very easily stained. Expect to reach harvesting age at around 50 years which is a short time for a hardwood. Previous issues of establishment, frost damage and poor form have been drastically reduced with Walnut Hybridisation. Pruning Walnuts should be carried out mid Winter or mid Summer. Remove dead, diseased or crossing over branches and if you can help it, do not remove more than 20% each year. As with other Walnuts, the decaying leaves will prevent most other plants from growing underneath. Walnut MJ209 is self fertile and will produce edible Walnuts.